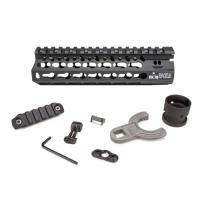 Bravo Company USA KMR-A7-556-BLK KMR KeyMod Rail Alpha 7" Handguard FREE SHIPPING! The Bravo Company USA KMR KeyMod Rail Alpha 7" Handguard is a lightweight accessory attachment solution for assault rifles, designed to fit military spec barrels. It is made from strong, lightweight aluminum, and comes with a hardcoat anodized finish that prevents corrosion and wear. The KeyMod system is compatible with an impressive range of accessories to suit any mission, and the handguard includes offset mounting positions between the 3, 6, 9 and 12 o'clock points for increased placement freedom. Its innovative attachment system locks it securely into place, providing stable and consistent positioning. It features a BCM KeyMod Sling Mount for sling carry. ©2002-2019 CopsPlus.com: Bravo Company USA KMR-A7-556-BLK KMR KeyMod Rail Alpha 7" Handguard FREE SHIPPING!